Captain Brown holds a world record for the most aircraft carrier take-offs – 2,407 and the most landings – 2,271, and on 3rd December 1945 became the first ever pilot to take off and land a jet aircraft – the Sea Vampire – on a carrier. 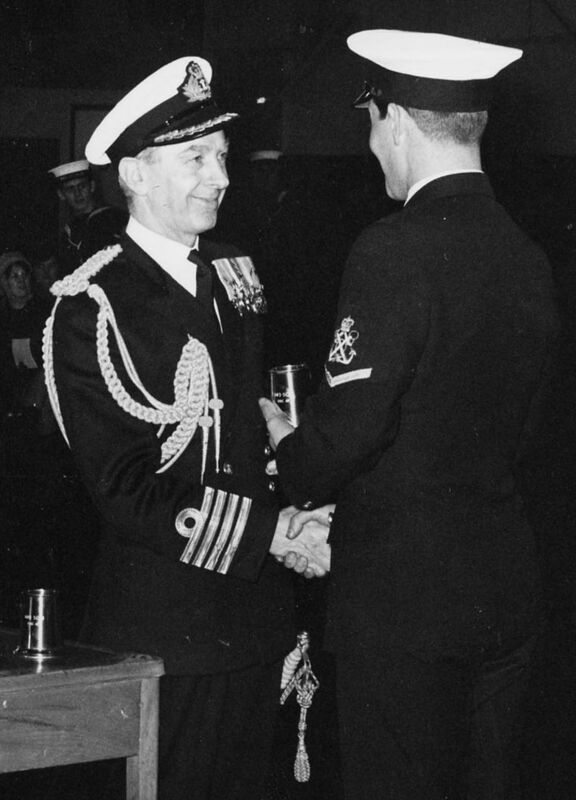 He went on to make many contributions of wider significance to aviation history , using his Fleet Air Arm experience to fly a world record breaking 486 types of aircraft, and to test aircraft for other services and for allies. It is a homecoming for the Boulton Paul Defiant Mk 1, the last surviving example of its kind, built by Boulton Paul at its Pendeford, Wolverhampton factory in 1938. This two-seat turret fighter, operated with mixed fortunes during the Battle of Britain period but found its niche as a night fighter during 1940-42. They were used extensively later in the war for air-sea rescue and target tug roles in the UK and Middle and Far East. The museum’s example, serial number N1671 was operated by the newly formed No 307 (Polish) Squadron RAF, who became operational in December 1940. It was painted in its all black night fighter colour scheme the following January and carried out 15 patrols before moving to No 285 (Anti-aircraft Co-Operation) Squadron in June 1942, its last operational user. It was originally set aside for preservation in 1944 and spent several years moving between RAF bases for display. N1671 was eventually acquired by the RAF Museum in 1971 and after almost four decades on display at the museum’s London site, the aircraft was completely restored by Medway Aircraft Preservation Society at Rochester Airport in 2009, going back on display at the museum in 2012. Now the sole surviving intact example of its type has made the 130 mile journey from London to Cosford where it will go on public display early in the New Year. 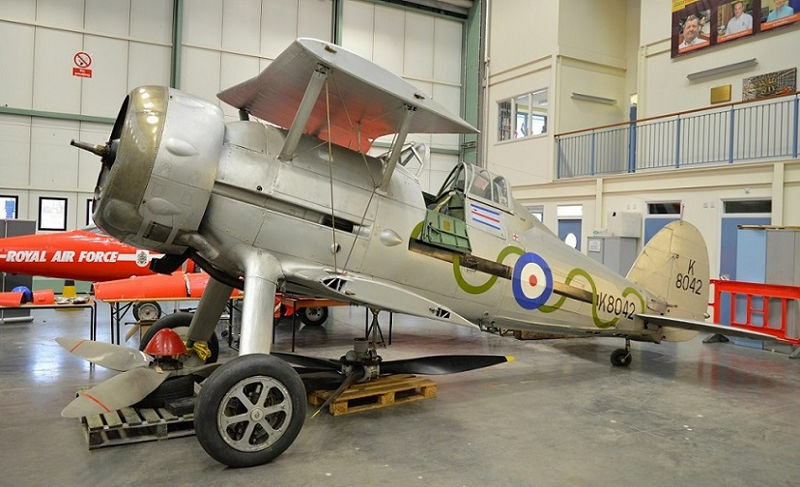 Another new aircraft to wing its way to Cosford is the Gloster Gladiator 1, the first enclosed cockpit and last biplane fighter introduced into RAF service. Although Gladiators saw operational service at home it was most successfully employed overseas particularly in the defence of Malta. At the outbreak of the Second World War, four home based RAF fighter squadrons equipped with Gladiators were sent to France and after just ten days of hard fighting, all the aircraft had been lost. In a desperate attempt to provide fighter cover for the ‘little ships’ involved in the Dunkirk evacuation, a detachment of home based aircraft known as ‘G’ Flight was formed at RAF Manston, Kent. They were quickly deployed to assist with the rescue of more than 338,000 British and French soldiers trapped on the beaches. During the early war years, Gladiators were used by the RAF in several other overseas operations including; Norway, Greece, North Africa and the Middle East. The museum’s example, serial number K8042 has been displayed at the RAF Museum London since opening in 1972 and this is the first time the aircraft will be displayed at the museum’s Cosford site. It’s not however, the first time the aircraft has visited the Midlands, having been stationed with No 5 Squadron at RAF Ternhill and No 61 Squadron at RAF Rednal, Shropshire in the early 1940s. K8042 was also used for gun trials and experiments, whereby an additional pair was fitted under the top wing, giving a total of six guns instead of the usual four. Also joining the aircraft collection at the RAF Museum Cosford is the Westland Lysander III, the only surviving Special Duties variant of this aircraft. It was designed to operate closely with the Army and had a remarkable performance which enabled it to get into and out of extremely small fields. A radical change in Army co-operation tactics meant that its lasting fame is not in this role but as a Special Duties aircraft ferrying Allied agents in and out of enemy occupied Europe. Four Lysander squadrons went to France in 1939 and despite some notable successes the Army Co-operation units suffered extremely high casualties – over 170 Lysander’s were sent to France; only 50 came back. After their withdrawal from France, they patrolled the coastal areas of south and east England as an anti-invasion reconnaissance measure. Late in 1940 they began air-sea rescue duties in the Channel and North Sea – not only could the Lysander spot airmen in the sea and bring surface vessels to them, it was able to drop a lifesaving dinghy and supplies. Financial penalties levied on banks involved in the LIBOR lending rate-fixing scandal will benefit the RAF Museum in North West London, the Chancellor Philip Hammond announced today. In today’s Autumn Statement, the Chancellor Philip Hammond announced that the RAF Museum will receive £3m LIBOR funds for its 2018 RAF Centenary Programme. The money will specifically support the development of a new exhibition and a dedicated Learning Centre – both of which are part of the Museum’s wider RAF Centenary Programme which celebrates and commemorates 100 years of the RAF in 2018. The new exhibition will explore the impact of the Royal Air Force on world events, society and technology since the Cold War through its many roles during the past 40 years – during an ‘age of uncertainty’. As part of the Museum’s contemporary collecting strategy, it is actively seeking out inspiring objects and stories that will engage visitors with the RAF’s recent history, to display in this innovative new gallery. 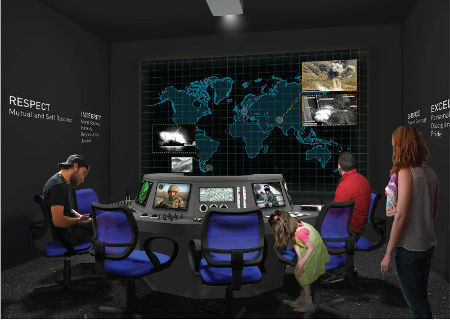 The dedicated Learning Centre will underpin the Museum’s Science Technology Engineering and Maths (STEM) programme along with hosting both formal and lifetime learning activities in history, literacy, art and design. The RAF Museum’s RAF Centenary Programme is a £23.5m project which will transform the site in North West London making it more accessible and welcoming to a new generation of visitors. Work has already begun for a completion date of summer 2018 and today’s grant of £3m means that the Museum is now in the final stretch of fundraising. The RAF Flying Clubs’ Association (RAFFCA) has announced that the application window for its Junior Rank Pilot Scholarship Scheme (JRPSS) 2017 is now open. The Royal Air Force Charitable Trust (RAFCT)sponsored scheme is open to serving RAF Regular and Reserve Junior Ranks (JR) across the UK who have been invited to submit their applications before 31 January 2017, after which 30 lucky candidates will be selected to receive flying training. The scheme has received an £80,000 grant from Trustees who recognise the huge benefits it has had on previous scholars. The annual grant, which has increased year on year, will enable the select 30 to each receive 15 hours of flying instruction on a light aircraft, which may count towards a Light Aircraft Pilot Licence (LAPL). All necessary equipment to undertake the training at selected RAF flying clubs will also be provided through the scholarship, including flying suits and study packs. RAF Flying Clubs’ Association Project Officer Flight Lieutenant Chris Hives said: “Since its launch, we have received a tremendous response to the JRPSS. We had more than 360 applications in 2016 and received submissions for 2017 before the application process had even opened! “This is an extremely generous grant from the Trust, which negates the need for any personal contribution – it couldn’t get any better for our JRs! Some of the lucky JRs may even get to learn to fly in the new Tecnam training aircraft, based in Scampton, which was purchased by the RAFCT last year to enhance the delivery of the scheme. Once candidates have successfully completed the scholarship there is also the opportunity to apply for the JRPSS Top-Up-Scheme which provides additional funding for those selected to continue their flying training and achieve their LAPL. The 30 successful applicants will be announced on Monday 13 February 2017. Any applications made after the closing date will not be accepted. All training for successful candidates must be completed between 1 April and 30 September 2017. The JRPSS was launched to improve the airmindedness of Junior Ranks by offering them flying experience and the opportunity to increase their knowledge and understanding of the technologies used in aviation.In just two years, the scheme has already benefitted 40 serving personnel. The Messerschmitt BF109G-2, designed by Willi Messerschmitt, is a legend alongside the British Spitfire, American P51 Mustang and the Japanese Zero. 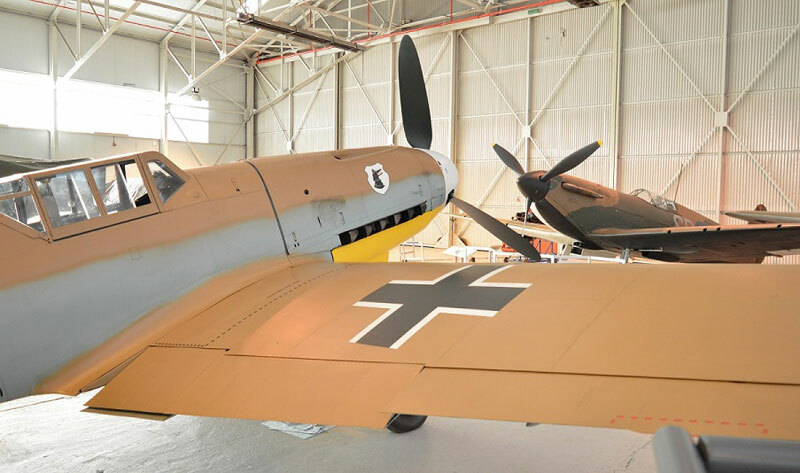 First flown in 1935, the Bf109 was obsolescent by the second half of World War Two yet it remained the backbone of the German Air Force’s day fighter force and was flown by many of her allies. In production right up to the end of hostilities, more than 33,000 were built second only to the Russian ‘Sturmovik’ as the most prolific military design, and post-war versions served with the Czech, Israeli and Spanish Air Forces, the latter until the mid-1960s – with Rolls Royce Merlin engines. Compact, rugged, fast and heavily armed the Bf109 has the distinction of being flown by the highest-scoring fighter aces in history. With the promised availability of the new Daimler-Benz DB 605A German built engine, design work began on the Bf109G series where higher speeds were obtained, but manoeuvrability and handling were adversely affected. The Bf109G series will be forever linked with the daylight bomber-killing missions in defence of the Reich. German fighter pilots found themselves facing heavily armed American B17 Fortress and B24 Liberator bombers and later long range P38 Lightning, P47 Thunderbolt and P51 Mustang fighters. Ground down by the overwhelming odds, few survived the war. The second of the two new arrivals is the 1930s bi-plane the de Havilliand Tiger Moth II, originally produced as a development of the well-known Gipsy Moth. The Tiger Moth went on to become one of the world’s most famous training aircraft and provided the majority of RAF pilots with their elementary flying training during the Second World War. In the aftermath of the Dunkirk evacuation in 1940, almost any anti-invasion idea was considered and three extraordinary Tiger Moth conversions were put forward. Some were fitted with light bomb racks ready to undertake the bombing of enemy troops attempting a landing, whilst others were fitted with a tank in the front cockpit with powder dispensers located under the wings intended to dust the German troops with a poisonous insecticide as they waded ashore. A more revolutionary idea was the ‘paraslasher’; a scythe-like blade fitted to the aircraft and intended to cut parachutist’s canopies as they descended to earth. Fortunately none of these ideas had to be used, leaving Elementary Flying Training Schools to their vital role of pilot training. All the right Con-chords will be played as this year’s Christmas Concerts return to the Fleet Air Arm Museum on 1st and 2nd December. 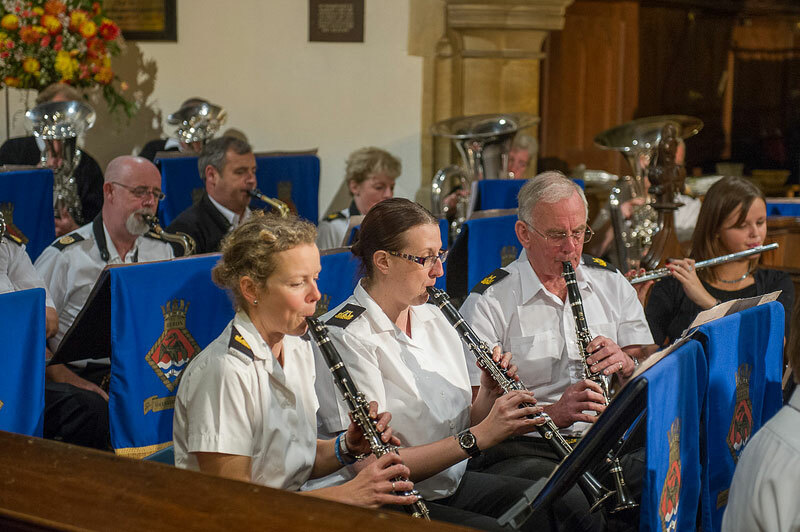 Visitors can join the HMS Heron Royal Navy Volunteer Band for the event, which takes place under the museum’s Concorde 002. The concert features several classics and festive numbers. Doors open at 6.30pm and the concert starts at 7.30pm. Tickets are £12 each and include a mince pie and mulled wine on arrival. A bar and refreshments will also be available. It is strongly recommended that those wishing to go purchase their tickets in advance. Scampton Airshow ticket sales take off! 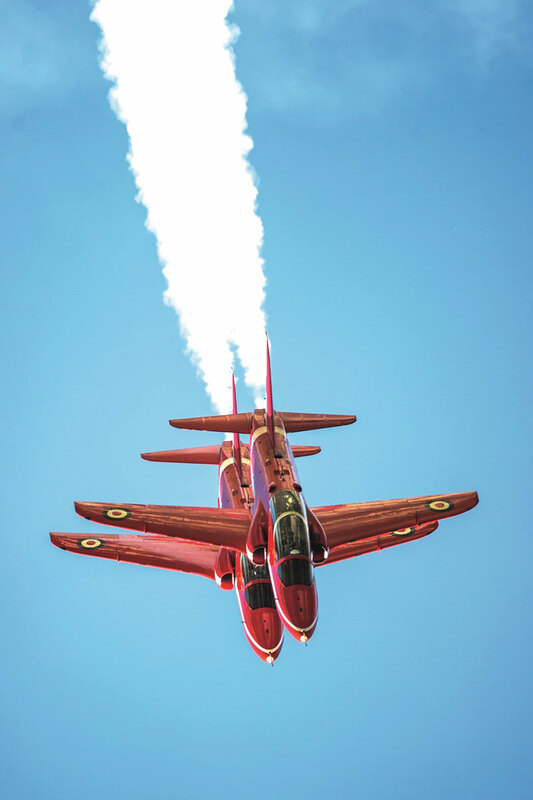 Tickets are now on sale for next year’s hugely anticipated Scampton Airshow! Lincolnshire’s new airshow at RAF Scampton will take place on September 9-10 at the home of the Royal Air Force Aerobatic Team – The Red Arrows. 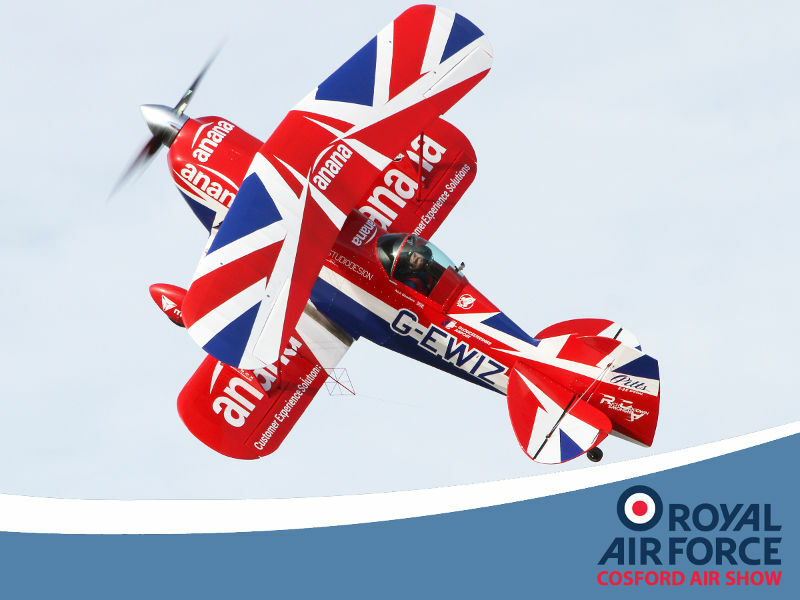 This exciting event, which will raise funds to support the RAF Charitable Trust, promises two fun-filled family days out eachfeaturing a spectacular five-hour flying display showcasing exciting aircraft from around the globe. It won’t all be about what’s going on in the skiesa bove Scampton. On the ground, visitors will be swept along on an aviation journey through the ages, from a nostalgic Vintage Village- offering access to the station’s Heritage Centre- through to interactive and engaging exhibits from across industry in the Techno Zone. There will also be the opportunity to learn about the modern-day Royal Air Force in the RAF Village where serving personnel will be on hand to give an insight into the many roles they perform. Those looking to attend the show should note that tickets can only be purchased in advance at www.scamptonairshow.com. 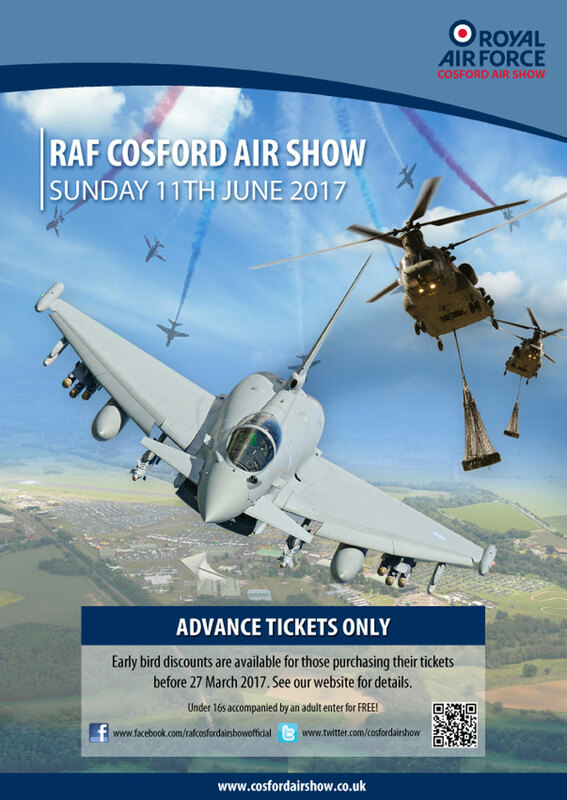 Tickets are priced at £39 withall under 16s able to enjoy the airshow free when accompanied by an adult ticket-holder.